Artecy Cross Stitch. Cochlear Love Cross Stitch Pattern to print online. 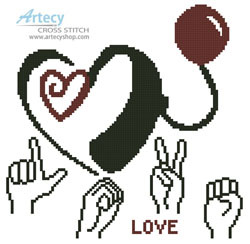 This counted cross stitch pattern of a Cochlear implant along with the sign language for love was designed by Tereena Clarke.